John Halliday Gillespie was born March 1, 1882 in Morrisburg, Ontario to stonemason James Johnston Gillespie and Sarah Halliday. The seventh of at least twelve children, Gillespie graduated from Morrisburg Collegiate Institute in 1901 and obtained a second class teaching certificate from the normal school in June, 1904. 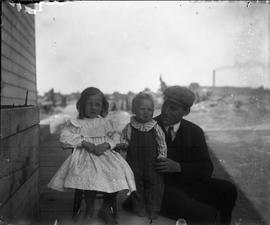 In January 1906, Gillespie began his new position at the Sudbury Public School in Sudbury, Ontario as a teacher and the First Assistant to the Principal. His classes included SR IV, JR IV, and for a brief time, SR III (ages 12-16). During this time, he most likely met his future wife, Margaret Elizabeth Arthur, who was the daughter of Dr. R. H. Arthur. In September 1906, Gillespie left teaching and enrolled in the medical program at McGill University in Montreal, Quebec. He was absent for the 1908-1909 school year for medical reasons and graduated with a specialty in surgery in 1911. After graduation, Gillespie returned home to Morrisburg, Ontario to work as a doctor in their hospital for a brief time before moving to Medicine Hat, Alberta where he became a general practitioner. Gillespie married Margaret Arthur in Toronto, Ontario on December 31, 1913. They had two daughters (Elizabeth Halliday Gillespie born circa 1916 and Margaret Louise Gillespie born February 11, 1918) and by 1921 moved to Windsor, Ontario. In 1930, the family lived in Queens, New York where Gillespie maintained his practice until his death after a brief illness January 11, 1932 at the age of 49. John Gillespie was interred at Mount Pleasant Cemetery in Williamsburg, Ontario (between Morrisburg and Mariatown, Ontario). Items were donated by Robert Jordan who found them inside an attic of an old brick house in Morrisburg, Ontario. John H. Gillespie's grandfather, Irish immigrant Thomas Gillespie built the first brick house in Morrisburg on Lock Street circa 1850. To see John Halliday Gillespie's entry in McGill University's 1911 yearbook, visit http://yearbooks.mcgill.ca/viewbook.php?&campus=downtown&book_id=1911#page/93/mode/1up. To learn more about John Gillespie, see The Sudbury Journal, January 4, 1906 p. 4, March 8, 1906 p. 5, April 5, 1906 p. 8, May 3, 1906 p. 5 and the New York Times, January 13, 1932.